Tempur-Pedic Pillows can be purchased at our office or over the phone. 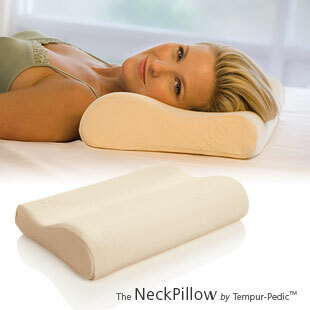 The NeckPillow by Tempur-Pedic™ is recommended for those who desire not only a better night’s sleep but also need a more therapeutic sleep posture. The dual-lobe design supports the curve created by your head, neck and shoulders to properly align your spine and give you a perfect night’s sleep! It is important that you choose the proper pillow thickness based on your shoulder dimensions and sleeping position preference to promote an anatomically correct posture. A pillow that forces your head too high or allows it to fall too far back not only places stress on your neck, but could inhibit breathing. The ClassicPillow by Tempur-Pedic™ has been updated with our softer formulation of TEMPUR® material currently used in The SymphonyPillow by Tempur-Pedic™. Molded into a traditional pillow shape, The ClassicPillow by Tempur-Pedic provides pressure-relieving comfort with a slightly softer, yet supportive feel to fit any sleeping position. The soft, velour cover is resistant to allergens and mites and is removable for washing. 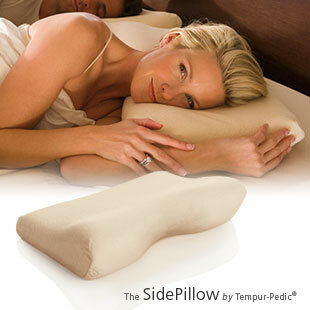 The SidePillow by Tempur-Pedic® design surrounds your shoulder and cradles your neck when you sleep on your side. The ergonomically contoured shape developed by doctors ensures proper alignment, support, and comfort. Shoulder, neck and back pain are relieved by allowing your neck and shoulder muscles to relax completely. Helps prevent snoring and other sinus related problems that may disrupt sleep. Our new, softer formulated TEMPUR® material harmonizes perfectly with the unique dual-sided design of The SymphonyPillow by Tempur-Pedic® to provide a slightly softer, yet supportive pillow to fit any sleeping position. The gently arched side provides additional head and neck support for back sleepers while the other side provides a more traditional pillow feel and works well for side sleepers. The soft, luxurious cover is resistant to allergens and mites and removable for washing. The ComfortPillow by Tempur-Pedic®, our traditionally shaped pillow, provides the plush comfort you want, the body molding support you need and the luxurious appearance you desire. Individually formed, independently moveable TEMPUR® micro-cushions fill a specially designed cover, also made of TEMPUR pressure-relieving material. The RhapsodyPillow by Tempur-Pedic® provides pressure-relieving comfort in a more traditional pillow shape. The patented design of this luxurious pillow features a superconforming inner sleeve lined with TEMPUR-HD® and generously filled with shapeable, TEMPUR® micro-cushions. The removable, washable and allergen resistant outer cover is dual sided with TEMPUR-Tex® on top and micro suede on the bottom to match the top and sides of its mattress namesake. TEMPUR-HD, a higher density formula of our proprietary TEMPUR material, creates a luxurious, deep sleep experience. More TEMPUR cells across the sleep surface conform to every angle of your body with exacting precision, providing even more support, greater pressure relief and unsurpassed durability. We’ve carefully crafted this ultra-luxurious pillow to complement The GrandBed by Tempur-Pedic® in every way. The plush, blended silk outer cover is removable for easy cleaning (dry clean only). Inside, our finest pillow features a super conforming inner cover lined with TEMPUR-HD® and generously filled with shape able, TEMPUR® micro-cushions. The BodyPillow by Tempur-Pedic® was developed to provide the pressure-relieving comfort of TEMPUR® material in a traditional body pillow shape. The patented design features individually shaped TEMPUR micro-cushions filling an inner sleeve also made of TEMPUR material and can be shaped or fluffed to fit your needs. The generously filled 48″ long design provides extra stability and support for your entire body — making it ideal for side-sleepers and expectant mothers. Features a removable silk and bamboo blend cover that is washable, allergen and mite resistant.